Ok, let’s take a look at the different types of Silverlight applications that you can create out-of-the-box with Visual Studio 2010. Now that I’ve installed Visual Studio 2010 and Silverlight 4, I want to take a quick spin through each of the different project types that the New Project wizard makes available. I’d like to take a quick look at each project type, looking at the pieces that make up the project and then thinking a little bit about when to use that particular project type. As I walk through the various project types, I’d also like to think a little bit about the ecosystem in which the Silverlight application lives. In other words, what other components might you typically create when designing a solution of that type? I also want to think a little bit about the tooling. What tools would you typically use to work on the project that you’re creating? Would Visual Studio 2010 alone be sufficient? Or would you spend a lot of time working in Blend? What about SQL Server 2008? The first project type—the Silverlight Application—looks like it might be the same thing that I created with Visual Studio 2008 and Silverlight 2, back in the Hello Silverlight World, Part 1 post. 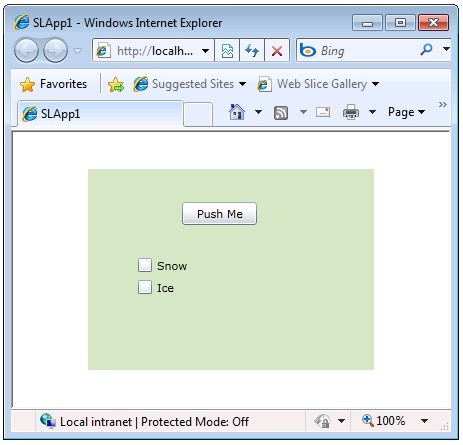 The New Application dialog that we see next is very similar to what I saw with Visual Studio 2008 and Silverlight 2. As before, we have to host our Silverlight application somewhere. Notice that this time we have one additional project type that we didn’t have before—an ASP.NET MVC Web Project. So we can basically go with a “classic” ASP.NET web site or an MVC web site. If you go this route and then press F5 to “run” your Silverlight application, Visual Studio will just create a test .html page in which to host your Silverlight control. If you take a look at this page, you’ll see a simple HTML page with a familiar <object> tag hosting the Silverlight control. 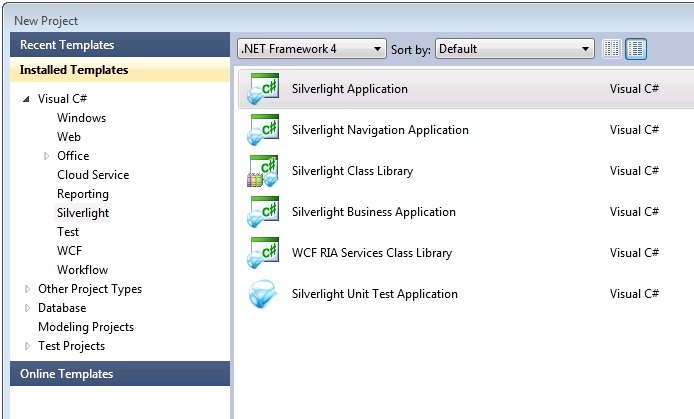 (See my post on the Lifecycle of a Silverlight Control for more details on how this is done). 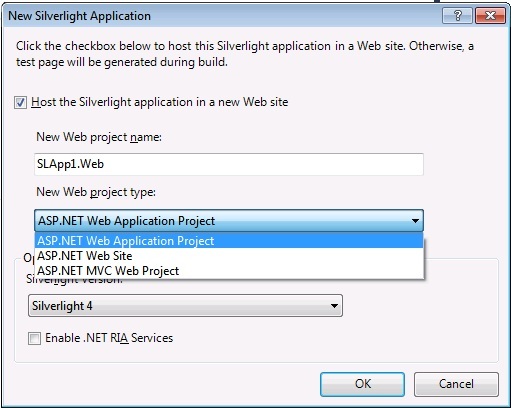 If we instead go with the defaults on the New Silverlight Application dialog (host the Silverlight Application in a new ASP.NET Web Application project), we end up with a simple ASP.NET project that contains both .html and .aspx pages hosting the new Silverlight control. As I describedin The Lifecycle of a Silverlight Control, this <div> tag embeds your Silverlight application (control) into a web page using the application/x-silverlight-2 MIME type. This MIME type now maps to the AgControl.AgControl.4.0 class, implemented in npctrl.dll, which can be found in C:\Program Files\Microsoft Silverlight\4.0.41108.0. One final topic to cover quickly is–what exactly does the downloaded .xap file contain? In our wizard-generated test project, you’ll find a ClientBin directory, which contains the compiled Silverlight application in a .xap file. In our case, it’s named SLApp1.xap. The main pieces here are the application manifest, which tells the Silverlight runtime what object to start up first, and the assembly in which that object lives. 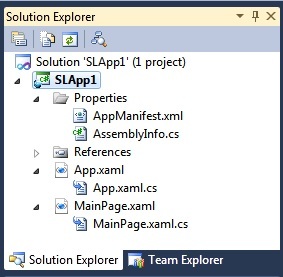 The .xap file also contains the assembly (SLApp1.dll) that contains our actual code. The .xap file also contains some dependent DLLs, which are sent down to the client as part of the .xap package. That’s all there is to a basic Silverlight Application. 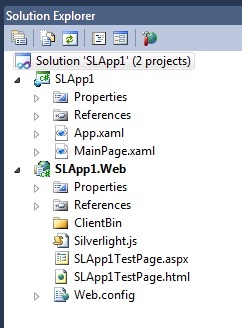 Next time, I’ll take a look at the Silverlight Navigation Application, which lets us create a complete Silverlight application with multiple pages, rather than a single user control.